ICG backpacks set the standard for comfortable, intelligent, and durable design in the brutal canyon environment. Our Heaps packs ride as smoothly as backpacking packs, but sacrifice unneeded bells and whistles to deliver sleek, technical performance. The packs shed water quickly, rarely get caught up on canyon debris, and are big enough to stow everything we need on long guided days. 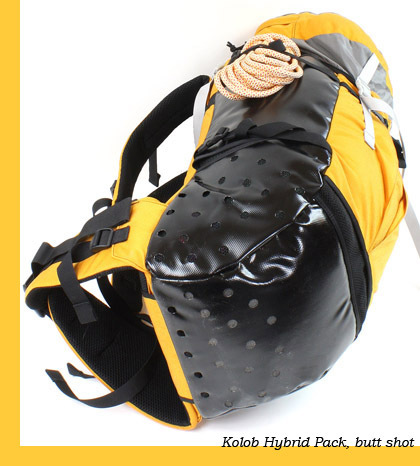 The Big Kahuna of Canyoneering Packs, the Heaps is a medium-sized backpacking pack built from the ground-up for canyoneering. Big enough for several-day adventures in the Grand Canyon, yet small enough to actually do stuff while it is strapped to your back. 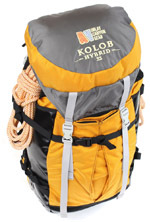 Perhaps the most versatile of the Imlay packs, the Kolob is the daily workhorse for the canyon leader who must carry substantial gear. Tube-Light Frame, full-wrap hipbelt and three-point shoulder straps carry your stuff in comfort. If you have only one canyon pack, the Kolob is the choice. Many canyons do not require vast quantities of gear, and the Spry is for these canyons. A little lighter, and a little easier to pull through tight canyons. A good choice, especially for canyoneers of modest stature. Simpler, less. While designed for guiding, the Mystery makes a good 'large pack' for small canyons. Built to the same dimensions as the Spry, with NO LID and less armor, it is ideal for low-gear canyons where less is more. Make me smile! The Lep is just big enough for what you need, and not big enough for what you don't need. 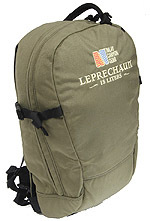 When canyons are dominated by climbing and a pack, any pack, is a substantial encumbrance, the Leprechaun really shines. It is smaller than you are, and glides gracefully through the canyons, just like you do. Ideal for canyons where WAY less is WAY more functional. Many canyons do not require vast quantities of gear, and the Spry is a good choice for these canyons. A little lighter, and a little easier to pull through tight canyons, than a Kolob. A lot more space than a Leprechaun. A lot more armor, more functionality than a Mystery. For those of modest stature, a good overall pack. For us full-size folks, a favorite for all but the big boy canyons. Back In The Day, there were two choices in packs. Some people (let's call them "Europeans") made packs out of extremely durable plastic-laminate fabrics which held up really well, but due to the fabric's stiffness were extremely simple. A bad pack that is very durable is still a bad pack - it just means you have to suffer through it for a long time. 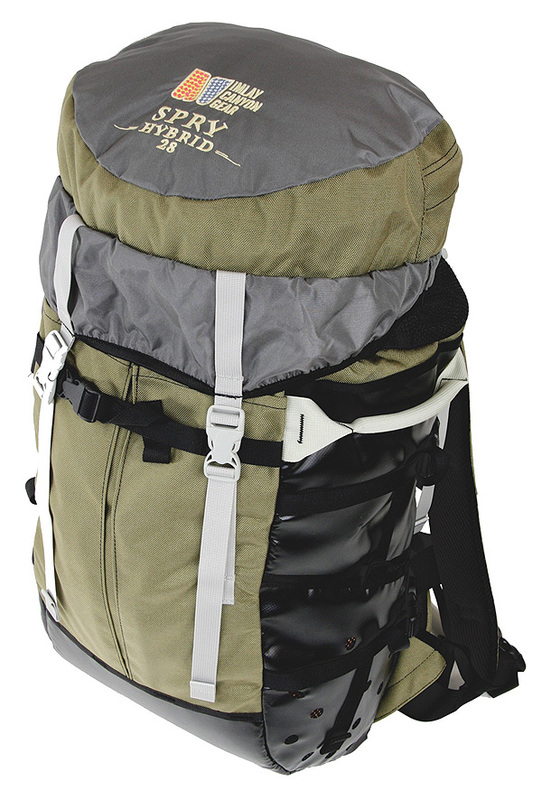 Other people (we could perhaps call them "Americans") used packs made of Nylon Cordura with lots of straps, pockets, zippers and sophisticated suspensions that carried really well - but did not last long in the abusive canyon environment. 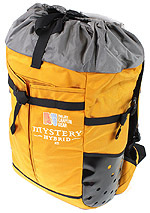 Imlay Canyon Gear Hybrid Packs select the best attributes of both these systems. Heavy duty laminated PVC fabric forms the armored exterior of the packs. Sophisticated shapes and features are taken from the American tradition of high-performance packs - though we tend to focus on the "carries really well" part of that tradition, rather than following the current backpack fad of fabulous complexity. Our Insta-Drain Design provides lots of places for water to drain out, and eliminates places for water to catch. Details: Hybrid packs are, in essence, one pack inside another. The interior pack is made of heavy and coarse nylon mesh, which allows water to move along the mesh to the drain holes. The interior pack also keeps your stuff inside, should the canyon chew holes in the exterior of your pack. The outside of the pack is armored. The sides and bottom are PVC laminate fabric, with drain holes punched in it near the bottom. 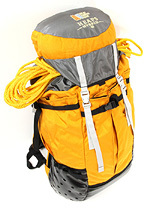 The bottom panel is backed with foam which adds to the life of the pack. Exterior Pockets are pleated, thus putting (in most places) a triple-layer of 1000 denier Cordura Nylon fabric between the canyon walls and your stuff. In five years of canyoneering pack-making, I have studied where packs get beat up, and where they don't. The side of the pack that touches your back (usually called the "back") is a part of the pack that does not get beat up. Much. Perhaps it is the foam panel behind the fabric, which makes that panel always smooth, but my experience is that the Cordura back panel holds up well, and is considerably more comfortable than PVC against your back. I have applied the Hybrid design to several different sizes of packs. The 18 oz PVC laminate is considerably heavier than the 11 oz Cordura. Smaller packs, where the weight penalty is less of an issue, get more armor, while the Heaps pack, our backpacking-size pack, gets less armor to keep its weight reasonable. The Spry gets the most protection, essentially, fully armored. The Spry's suspension is simple, yet effective for the volume and weight carried in this size pack. A chunk of foam in the back is 1/4" thick and folds in half to provide 1/2" of padding. It can be pulled out for the unfortunate night-out, or to be used as a splint. A simple sheet of plastic provides additional support. The comely shape of the back panel helps it mold to the shapely curve of your back. The simple, wing hipbelts allow transfer to the hips; and both the hipbelt and the shoulder straps are lined with comfy nylon 3-D mesh. The Volume of the pack body is about 23.2 liters, and the lid, our standard pack lid, is about 4.7 liters. The pleated back pocket is sized to fit a helmet on the approach. In-canyon, it is a good idea to not put things in the outside pocket, but put everything inside the body. If the canyon is scrapey, putting the lid inside the body will keep it from getting beat up. Inside the pack, a mesh watertank pocket against the back can be useful for holding objects in tight control against your back. I don't like using a watertank in technical canyons, but I often put my waterbottle in the mesh pocket. There are slots for the tank-tube to exit above the shoulders. The Sidewinder handle is a subtle feature. When dragging the pack behind you in a narrow canyon, the cross-ways handle allows the pack correct (narrowest) orientation without having to cant your wrist 90 degrees. It is then natural to hold the pack in the narrow orientation, and puts considerably less strain on your wrist. The Spry has TWO handles, a SideWinder and a regular. Imlay pack handles are big and easy to grasp, and stout because we canyoneers rappel with the pack, and often need to dangle the pack from the handle. 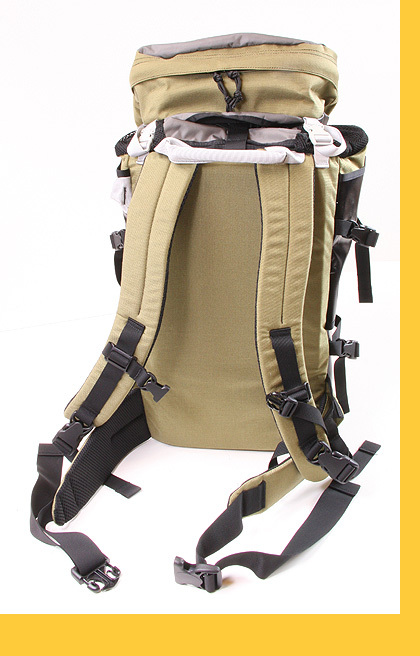 The shoulder straps on Imlay packs use a quick-release buckle so that when stuck with the pack on your back, the pack can be easily jettisoned. Not recommended, but once in a while this proves useful. Where are your packs made? Imlay Packs are made in The Philippines using materials sourced in South Korea. How is the pack volume calculated? I used to make a number up, but now they are measured with ping pong balls. The "Volume" number stated by manufacturers is a way of communicating the volume of the pack, and has traditionally had only a remote attachment to physical accuracy. I chose numbers based on my experience as pack manager at Black Diamond, where we did actually measure pack volumes using plastic balls. In Fall 2010, I bought a set of balls (I know, I know) and actually measured the packs, so the current stated volume is accurate, though it may not reflect the same size as stated volumes from other manufacturers. The stated volume does not include the pleated pocket. I am "X" tall. Will the Spry pack fit me? Because the suspension does not have rigid structures, its shape morphs to fit the person carrying it, within limits. The Spry fits well on smaller adults - say 5'2" to 5'10" - and fits less well on people smaller or larger than that. Whether it meets your requirements for a good fit is up to you. The zipper on my lid is chewed up. Can I get it fixed? Under warranty? Fixing zippers does not work, but we do have new lids for sale. Replacement is not covered by our warranty, however, beating your gear up is. What IS the warranty on your packs? WARRANTY: Imlay Canyon Gear products are warranted against defects in materials and workmanship. We also warrant that canyoneering will beat the crap out of you, your clothing and your gear. If you have a problem with one of our products, please contact us to arrange action. What "known problems" are there on the Spry Pack? - 2007 to 2009, the sternum strap has a whistle on it which is kind of a cheesy little whistle but occasionally useful. But the buckle that the whistle is available on is not a very good buckle, so for 2010 we have gone to the better buckle and dropped the whistle. If your pack sternum strap buckle has broken, please return the pack and I can put on a new buckle. - 2007 & 2008 - the stitching on the shoulder straps occasionally was not strong enough. If it looks like it is coming out, please send your pack in for reinforcement. - 2007 & 2008 - the stitching on the lid straps occasionally was not strong enough. Please send the lid in for reinforcement if it looks like the front buckle straps are coming out.